You need great digital signage dashboards - we have great dashboards for you to use. Here’s everything you need to know. You know what we get asked for a lot? Great digital signage dashboards. They say that data is the new world currency and most of us are swimming in it. Dashboards can help you sift through data, package it nicely and showcase it to your audience, in a seriously compelling way. ScreenCloud’s interface makes it simple to set up a great looking digital signage display with no design help needed. This allows anyone to add images, videos, social media and other dynamic apps in minutes, even seconds! But when it comes to creating a dashboard perhaps you need a little assistance. Enter one of our partner apps Dash. This awesome tool makes it super simple to get a great looking display up in your office, lobby or shop. Sharing information and keeping everyone in the know of the key goings on within your enterprise. Imagine looking up and seeing your latest sales figures, or how many followers you’ve acquired through a Facebook ad campaign. These stats and more are all available! Getting them onto your digital screen is simple. In this post, we’ll share top tips from the dashboard experts into why dashboards are important, what you can use them for and how to get started. Dashboards keep all of your data in one place - something that can be difficult when companies grow and process overrides logic. In the ScreenCloud office we have a dashboard which pulls in snippets of the most important information for our team. It updates automatically each day and generates graphs which track our progress against our forecasts. There is no more crucial information for our team to know and understand - and it’s right up there on the wall for everyone to see. The beauty of digital signage dashboards is that they pull in multiple sources of information. Dash offers integrations with everything from social media feeds, to email software management, app analytics platforms, web analytics and ecommerce platforms - the options are endless! So you could choose just one data stream (perhaps email marketing, or social media figures), or you can select multiple sets and add them to one digital display. There’s no ‘one size fits all’ use case here - data is personal and deciding what’s relevant to your audience is your first step to providing them with a display that’s high in value and low in effort. This digital signage dashboard example from ASM Research using Dash is a great example of a dashboard that’s been tailored to a specific audience. 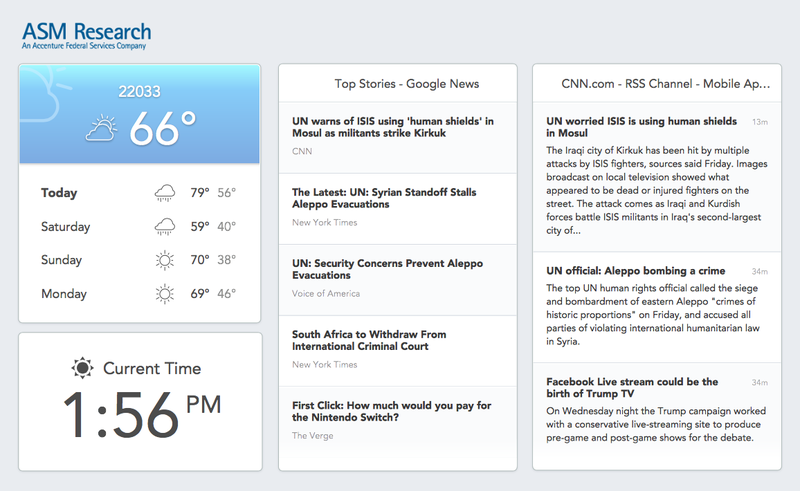 See how they use Google news alerts and a CNN RSS feed to pull just the news stories they’re interested in? Absolute gold. The mix of general information (weather and time) alongside the stories makes this a perfect use case of a digital news dashboard done well. When you know your audience well (and if you’re reading this, I’m guessing you do) it’s easy to begin narrowing down what they’re interested in. If in doubt, test a few displays and see what resonates. Particularly for internal displays, your employees are likely to be a vocal source of feedback on what they want to see and what they don’t. Providing the right content is only half of the story - you also need to provide it at the right time. This can be achieved through simple playlist and scheduling tools and you guessed it, ScreenCloud offers just that. This can be as simple as scheduling by day of the week, for example setting targets on a Monday and reviewing progress on a Friday or can be used to show different displays throughout the day. Take this example that’s personalized for an individual working within an office space. 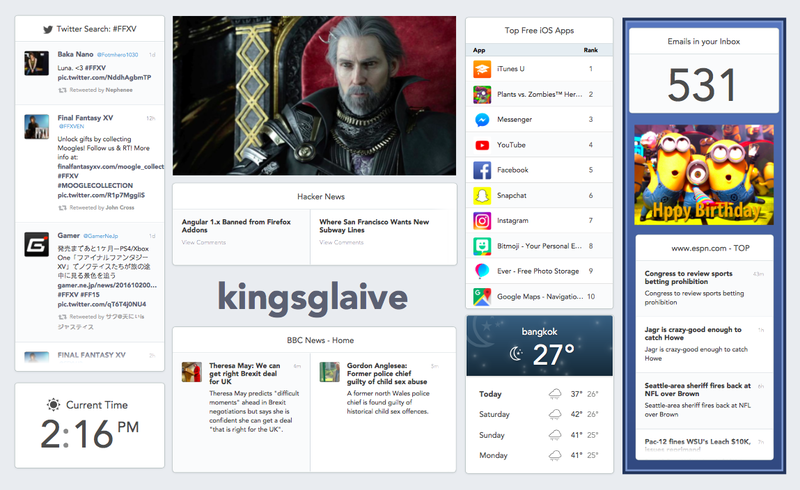 Here they have access to trending apps (displayed in real time), interesting news sources based on hashtags, favorite sites, weather reporting and even an inbox check. However you set up and segment your data, the crazy effective dashboards are the ones that think not just what does my audience want to see but also, when do they want to see it? One of our biggest bugbears with current digital signage displays is that when content is hard to update people don’t. Cue a series of boring, out-of-date, irrelevant communications being served to consumers and customers who just don’t really care. The decline of print against the rise of digital is just one use case that shows how the information served has to be relevant, interesting and personalized if it’s to be read or even considered. This is where data dashboards and cloud-based digital signage is your best friend! Who can forget to change an image slideshow or a video when it’s as simple as uploading a quick image to Facebook? How could you not pop up the latest email campaign figures when it’s as simple as logging into Mailchimp and letting your dashboard partner do all of the hard work? Even without doing anything, app integrations with the latest digital signage dashboards that show anything from the weather, to news, to statistics will all update automatically, pulling the very latest information for all to see. Your digital dashboard is going to live on the wall and chances are, it’s going to be viewed a lot. This gives you a powerful digital method to make your employees and customers feel really good. Even when the figures might not be going in the direction you hoped for, digital dashboards show statistics and it’s hard to argue with objective data. With great dashboard partners in our app store and the simplest signage system you’ll ever use right here at ScreenCloud it’s never been more simple to become a pro at the management and display of data.